ISO 55000 Enterprise Asset Management | SwainSmith, Inc.
Align to industry accepted standards, see how ISO 55000 and SynergyTM are a perfect fit. At SwainSmith, we firmly believe that ISO 55000 compliant management systems are the most effective way to improve asset management over the long term. This belief is grounded in decades of experience in which we have seen a management system approach improve EAM information, cut MRO costs, increase uptime, reduce risks, and boost productivity for client after client. The formula is simple: management system + software system = effective, efficient, information-driven asset management. To support this approach, we offer comprehensive management system design, consulting, and auditing services for clients’ physical assets. 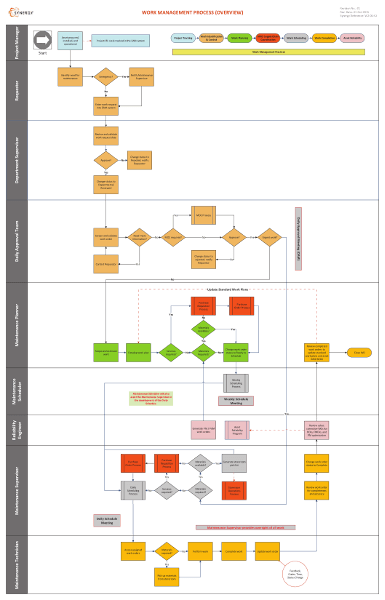 What is an ISO 55000 management system? An ISO 55000 management system is a model of practices, processes, and procedures that an organization implements to achieve its objectives. It uses documented policies, responsibilities, and procedures to standardize and coordinate activities so a business can deliver on its goals. An ISO 55000 management system ensures that everyone knows who does what, and how things are done, so that tasks are performed the same way across the organization. It aligns technology with practices, and practices with objectives, so that all of the elements in a business work together to realize the business’s goals. It also includes performance measures and auditing processes so that an organization can continually evaluate and improve the way it operates. ISO Management systems are best known for their use in quality and safety management, but their structured approach can be applied to any area where discipline and control are needed. For this reason, they are particularly valuable in enterprise asset management. A management system provides the consistent, deliberate practices that are needed to manage physical assets – and use an EAM software system – effectively. Management systems make EAM software systems successful! In the last few years, management systems have increasingly been recognized as a best practice for enterprise asset management. The ISO 55000 series of standards, published in 2014 by the International Organization for Standardization, provides recommendations and requirements for an asset management system – i.e., a management system used to administer and maintain a portfolio of physical assets. With ISO 55000, the international community of asset management experts issued a clear statement: if a company is serious about asset management, it needs a management system for its assets. Because of ISO 55000, asset management systems are quickly becoming the standard in highly regulated industries, such as public utilities and food manufacturing, where companies need to demonstrate good stewardship to customers, stakeholders, insurance agencies, and government regulators. Asset management systems are also being used increasingly in other industries, such as oil and gas, where managing the health and cost of physical assets is vital to companies’ profit margins. But asset management systems aren’t just for big, highly regulated businesses. A management system for assets makes maintenance, storeroom, procurement, and related business functions operate more effectively and with greater consistency. Any business – even a small one – can benefit from establishing formal policies, processes, and procedures for asset management. This is especially true for businesses that have implemented, or are thinking about implementing, an EAM software system. A management system is an EAM software system’s best friend. EAM systems rely on consistent practices in order to collect thorough transactional data and produce accurate, actionable reports. Management systems provide this consistency. They ensure that things are done the same way every time and that all steps are followed in a given process or task. Take, for example, the process for how maintenance work is identified, reviewed, approved, planned, scheduled, and completed. Each of these activities should be executed the same way each time. If a step is skipped or performed incorrectly – for example, if a maintenance technician fails to enter a failure code or enters the wrong failure code when completing a work order – then the data that enters the EAM system will be faulty. This compromises the information that comes out of the EAM system, making it harder to make informed and educated asset management business decisions. When used together, management systems and EAM systems are ideal partners. An EAM system needs standardized, consistent inputs in order to produce reliable information, and a management system’s structured approach provides this. A management system relies on accurate data and efficient technology in order to deliver on objectives, and an EAM system provides both. The two bring together practices and technology to make an organization effective and efficient. The management system provides the practices, such as developing a weekly work schedule or monitoring mean time between failures (MTBF), that are needed to achieve certain goals. The EAM system provides the technology, such as work scheduling tools and automated MTBF reports, that are needed to implement those practices efficiently. Management systems make EAM systems successful. Yes, it’s possible to implement an EAM system, and even extract some useful information, without a management system to support it. But only a management system provides the long-term direction and consistency needed to achieve significant, sustainable results with an EAM implementation. What are the benefits of establishing an asset management system? Identifies the required steps to perform common tasks. 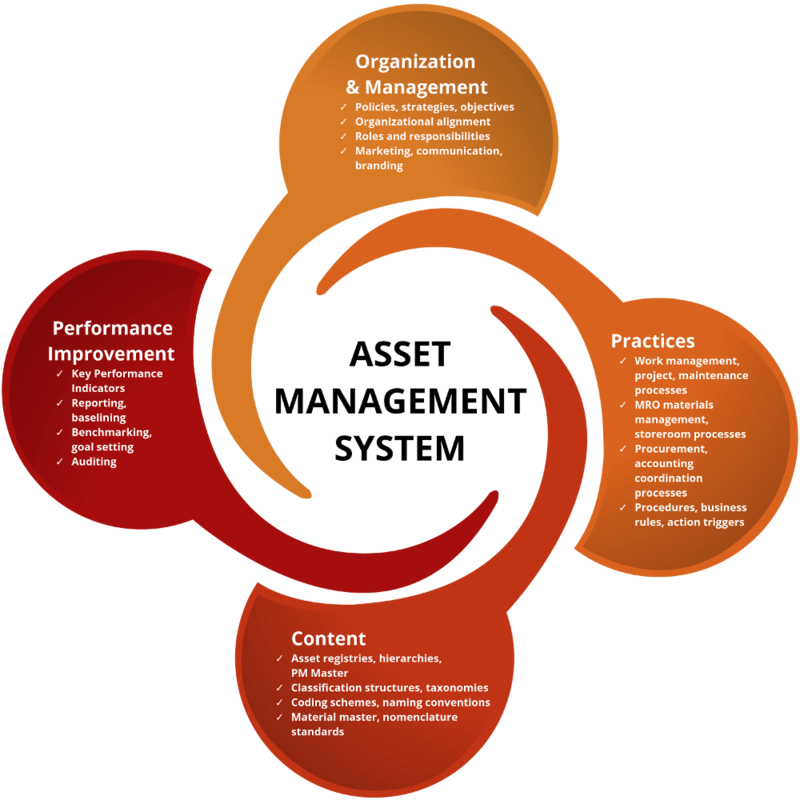 Provides processes and benchmarks for measuring employee and department performance. Serves as a training tool by thoroughly describing policies, tasks, and responsibilities. Improves data output quality by establishing consistent practices for data input. Facilitates change management by providing documentation for new processes and procedures. Delivers an executive mandate for how the organization’s assets will be managed. Conveys that a business is serious about implementing effective asset management practices. Makes the EAM system easier to use by providing a template for configuring the software. Maps out a direction for the business by defining the desired end state and objectives. Replaces chaos with order by formalizing how the maintenance operation does business. Bringing structure and discipline to your asset management operation makes sense. SwainSmith helps EAM software customers get better information and create more value with their EAM products by establishing management systems to govern maintenance, storeroom, and MRO procurement activities. We provide a comprehensive portfolio of services to help organizations establish, maintain, and improve ISO 55000 compliant management systems. We’re proud of our clients’ results, which include an average 10–30% reduction in maintenance costs and 3–5% improvement in machine availability. 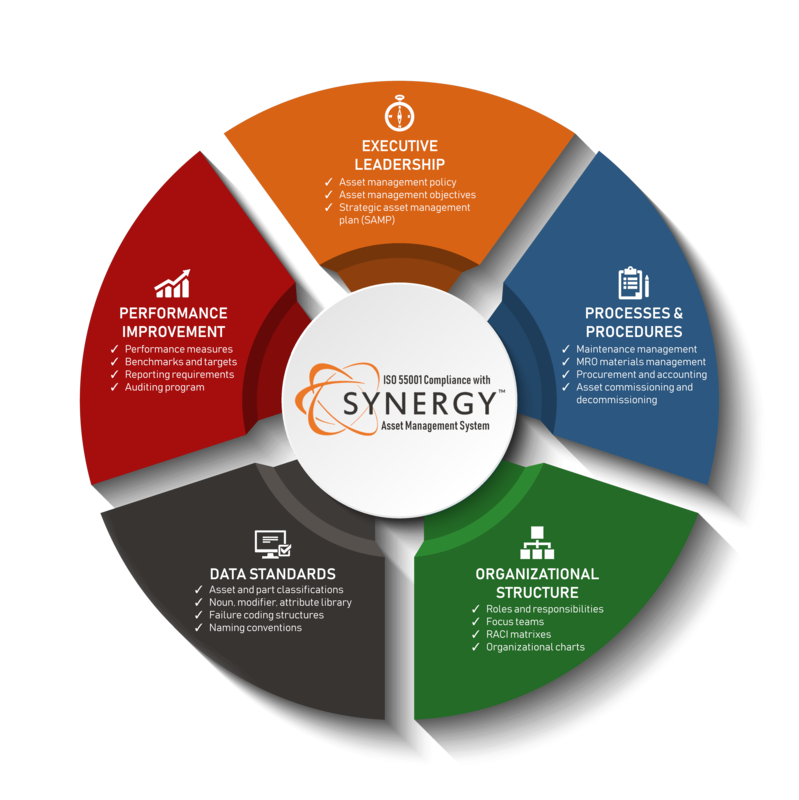 We facilitate the management system design process with SynergyTM, a proprietary model for ISO 55000 management systems that is unique in the industry. SynergyTM is an ISO 55001 compliant framework for asset management systems. It provides a complete, documented operating model (i.e., regime) for a business’s maintenance, storeroom, and procurement functions. SynergyTM is the product of 20 years of EAM consulting experience. It contains over 300 industry-proven policies, processes, organizational charts, responsibility matrixes, data conventions, KPIs, and other documentation. It is also completely customizable and can be tailored to fit the unique needs of any business or industry. Accelerates the development of an ISO 55001 compliant asset management system (while reducing development costs). Speeds up value realization by allowing you to implement EAM software, improve practices, and achieve certification sooner. Provides the asset management operation with a solid foundation of industry-accepted best practices. Designing and implementing a management system for your physical assets is not a small undertaking, but with SynergyTM, the most time-consuming work — like writing down processes and researching best practices — has already been done for you. The ISO 55000 approach is creating big value for our clients. Start producing rich and reliable EAM information. Lay the foundation for EAM/CMMS software success with the EAM Master Data Library from SwainSmith. We have been helping organizations improve asset management since 1997. Our management system approach to asset management sets us apart and creates long-term value for our clients. If you would like to have a chat about your asset management challenges, please let us know. You won’t get a sales pitch or pesky follow-up call. Just straight answers to your questions—and an objective, experienced assessment of your issues and goals. SwainSmith provides the EAM information organizations need to make smart decisions about their physical assets. SwainSmith Insights delivers weekly briefs on enterprise asset management from one of the industry’s leading EAM consulting firms. Sign up for the latest software tips, MRO strategies, and more.